Perfect for serving as a colourful appetizer, snack or part of a summer lunch! So versatile and simple to change the ingredients to make your own creations! So pick up some fresh fruit, veg, left-over rice or noodles, (let your imagination go wild with possibilities!) and get wrapping! Drizzle some Olive Us Denissimo or dress with a combo of oil and balsamic from Olive Us! Fill a large bowl with warm water (not too warm). Place one spring roll wrapper in the water, keeping it immersed for 10-15 seconds, until wrapper becomes slightly soft (it should still have some structure to it and not be completely soft yet). Place on a clean dry surface. Add 1/3 cup loosely packed spinach, followed by 2 Tbls strawberries, 2 tsp pecans & 2 tsp feta cheese. Fold the top, then the sides, then roll up as tightly as you can. 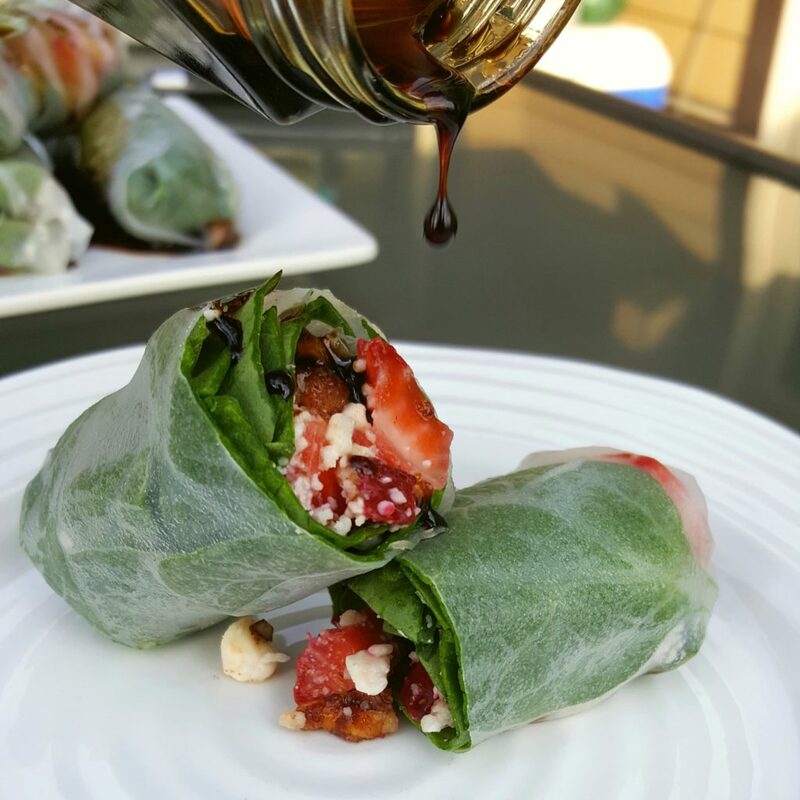 Drizzle with Olive Us Denissimo aged balsamic or dress with your fav oil & balsamic combo from Olive Us! Serve immediately and enjoy!